Ryan Deiss at Digital Marketer defines a lead magnet as “a small chunk of value that solves a specific problem for a specific market that is offered in exchange for an opt-in. My buddy (and co-host of the Podcast Review Show) Erik K Johnston did a whole episode about lead magnets. Today we talk about email lists and why you might want to start using one. Demonstrates your expertise or Universal Value Proposition – when someone consumes your lead magnet, it should demonstrate your expertise or your unique value proposition. This helps turn leads into customers down the road. Advantages of an Email List? The biggest advantage of an email list is you are one click away from your desired call to action, and more than likely you have someone's undivided attention. Most people (hopefully) are not reading their email while driving, etc. You can email your list directly and not have the information appear on your website. You are in contact with your engaged audience. His email list might be twice as large as his Twitter following but it still generated about 24 times more clicks. Even your grandma has email. Mailchimp is many times the place you start. Why? It' starts free (but if your list grows can be expensive). There are many, many companies out there. I've used Aweber before moving to Convert kit. 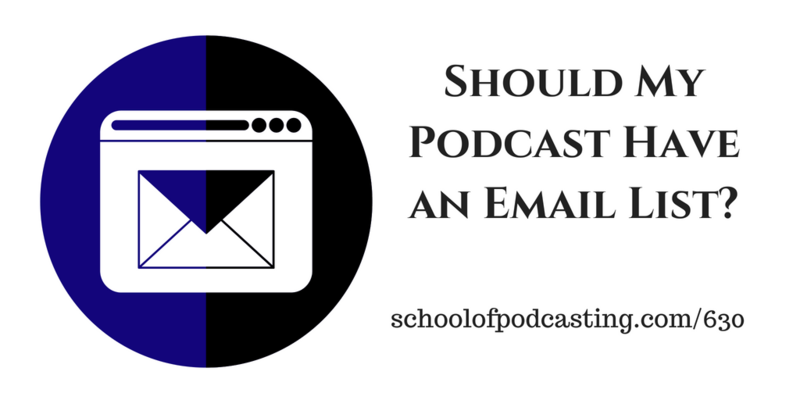 Do you need an email list when you starting a podcast, no. But, I hear time and time again that someone in year three pivots their show in a new direction and really, really wishes they had started an email list. Both Amazon Associates (amazon's affiliate program) and Mailchimp have it in their terms of service that sending email with affiliate links is against the rules. One of the things you should do upon signing up for an email service is to take the time to go through whatever tutorials they have. For example, I use Convert kit and to make a long story short I'm not using half of the features. When I was at Podcast Movement, I went to their booth, explained my situation and the rep show the features I could be using, and show how easy it is to use. With this in mind, I still need to take the time to learn the system. There is no sense spending money on a system that sits dormant. If you've attended any podcast event, was it worth it? If so, why? If not, why not? Please send those in by 8/24/18 go to www.schoolofpodcasting.com/contact if you are emailing them in please put “August Question” in the subject line. (and don't forget to mention your show).